Orrin Hudson told The Chess Drum, things are starting to open up for his BeSomeone, Inc. The Atlanta-based icon has been approached to play a small role in a film and continues to gain interest from his book, One Move at a Time. In his latest appearance on 11 Alive News, he recounted a case where seven employees were shot in the head execution-style for a measly $2000.00. "If I have a million dollars and you have kids are killing kids for money, then I'm a failure." Hudson's story is well-known on these pages and he continues to make moves to expand his message to a broader audience. 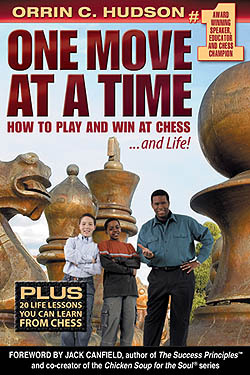 The video shows footage of his vibrant message which is chock full of chess metaphors and call-and-response exercisess that keep students engaged. Lessons of planning, strategy, concentration, decision-making, logic, patience are hallmarks of his message. It is inspiring to watch him in action and he certainly provides a community service that is sorely needed in communities far and wide. See 11 Alive News video!